Kitplanes: "Memories of the flying kind." 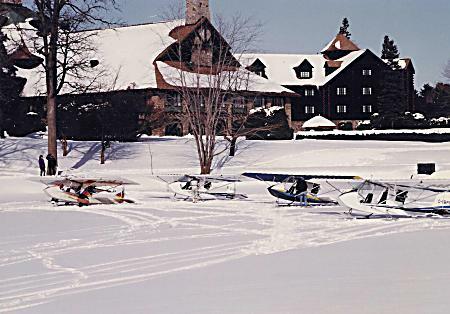 four planes to the Montebello resort in the winter. Ian Coristine's story "Four Seasons of Adventure" brought back a flood of wonderful memories for me. Two career changes and multiple moves necessitated selling my Challenger several years ago after it had travelled with me from Montreal to Victoria and ultimately Seattle. I used to live in the Great White North and do exactly the things that his story outlines. It was wonderful flying, low key adventures in the best possible sense. I find it hard to imagine why many more people haven't discovered this kind of flying. For the weekend Cessna renter who's tired of a sandwich at this airport or a coffee at that, this is a revelation. Who could possibly get bored with soaring, or skis, or floats, never mind wheels? Even if you get bored with any one of them, as the season changes, you change landing gear and have a whole new plane with a whole new set of abilities. And for a fraction of the cost. P.S. I've enclosed pictures of one of my favorite trips we took with four planes to the Montebello resort in the winter. I hope you enjoy them. Copyright Michel Gadbois. All rights reserved.